Long, narrow Vietnam has a lot of extremely beautiful coastline, but don’t stop your explorations there, the interior is incredibly varied and dramatic for the same reason. There are tropical, lowland jungles, home to elephants and leopards, and ancient karst mountains riddled with caves and underground rivers. And these are just the natural elements, Vietnam and the Vietnamese people offer lively commercial interactions at regular opportunities, but also tales of a history burdened with conflict. Occupied by China, France, and to some extent culturally, by America, Vietnam’s culture, food and architecture reflect these influences, but also builds on them, offering a really diverse range of experiences from the soul-touching and contemplative, to busy, hedonistic good times. And you can fit both into the same trip, and many in between. Our Gurus will help you start planning your trip with our recommendations for the best places to stay in Vietnam, based on both the places you might want to visit and the kind of experience you’re looking for for Vietnam. Vietnam’s cities are more than just the places most visitors will arrive via. Vietnam's capital, Hanoi, buzzes with life, from the ancient chaos of the markets in the Old Quarter to the modern chaos of the traffic system. The Old Quarter is a wonderfully uninterrupted warren of colonial and pre-colonial architecture and there are few buildings that are over five storeys high. And there's a wonderful east meets west look to Hanoi. The gardens and riverside markets are quintessentially Asian, but the boulevards are positively Parisian. This makes sense considering the French made Hanoi the capital of French Indochina from the 1880s to the 1950s. And then there’s Ho Chi Minh City: it wasn’t long ago that Ho Chi Minh City was Saigon, capital of the Republic of Vietnam, and much of the buzz and freshness of this city today stems from the dramatic changes that took place here in the 70s. Commerce is a busy, whirling king here, but the city’s cultural side, which embraces the past with vitality while propelling life forward, is a very powerful queen. Ho Chi Minh City is a wonderful mix of old and new, which is especially obvious in the architecture: French colonial and modern Vietnamese standing side by side. Beyond the cities there are a handful of places many travellers want to visit, Hoi An being one. Undoubtedly one of Vietnam’s most atmospheric towns, Hoi An is an historic delight on the banks of the The Bon River near Da Nang. In 1999, the old town was listed as a UNESCO World Heritage Site in an effort to preserve the core of historic architecture - a stunning mix of Vietnamese, Chinese, Japanese, and European styles - much of which has been converted into stylish restaurants, art galleries and tailors. 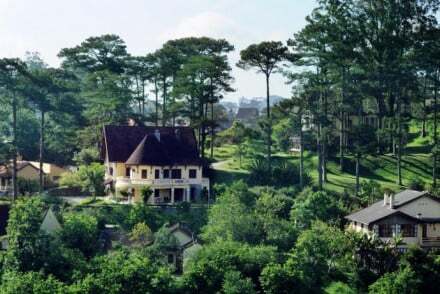 Dalat is nice too, very French colonial and surrounded by strawberry farms and coffee estates, rather than rice paddies. The old royal capital, Hue, will also be on the list of travellers with an interest in history. The city represents the outstanding demonstration of power that once belonged to the Vietnamese feudal empire. A crumbling complex of monuments, tombs and pagodas, only a fraction of the city remains, and it’s worth finding your own less-visited corner, as this is an extremely atmospheric place. Then there’s Vietnam’s coastline, Halong Bay being the headliner here. The gateway to the region is Halong City, but don’t plan to stick around, you’ll want to head out onto the emerald waters of the Gulf of Tonkin, which is scattered with the fantastically green-topped islands with their mysterious looking caves and grottoes. Lan Ha Bay and Cat Ba Island are more beautiful hubs, but there are plenty of island paradise resorts to choose from too. Nha Trang is another popular spot if you want to include a beach break in your Vietnam itinerary. This is a high-rise, high-energy beach resort town in a spectacular setting, ringed by a range of mountains and overlooking one of the world’s most beautiful bays. Nha Trang is also a great place for scuba divers. Or there’s Phu Quoc Island, which is known for its white sand and Long Beach, which is busy with megaresorts at one end but still sparsely populated at the other. This is a more peaceful beach break option. Or, for somewhere even more remote try the Con Dao Islands, an isolated archipelago of sixteen rugged, rocky mountains covered in dense forests and surrounded by coral reefs. Visitors in the know try to visit during sea-turtle nesting season, which is roughly between June and September. If you’re looking for dramatic landscape the remarkably ancient, cave-riddled karst mountains of the Phong Nha-Ke Bang National Park are fast becoming one of Vietnam’s highlights. There aren’t just caves and mountains to explore, there are underground rivers and incredible trekking terrain. The Cat Tien National Park in the lowlands of the Southwest is another natural wonder, though this time tropical one, with incredible birdwatching opportunities and deep, dark jungle, home to elephants and leopards. Or you might consider the Ba Be Lakes National Park with its serene limestone peaks, dense valleys dropping huge waterfalls, and of, course the great lakes of the park’s name. A cultural powerhouse, Hanoi is wealthy in both temples and museums. And markets. And places/ things to eat. But back to the museums, one of the most famous has to be Hoa Lo Prison, known as the Hanoi Hilton by American P.O.W.s and a relic of both the war with the US and the war of independence from France. Most of the exhibits tell of the period in the mid 1950s when American pilots were held here - including the future Senator John McCain. It does have a French guillotine too, though. The Vietnamese Museum of Ethnology is fascinating for a less grizzly reason, it houses a collection of art and artefacts collected from Vietnam’s different ethnic minorities, including a fantastic collection of traditional village houses. To get the full overview of Vietnam’s history you should also visit the National Museum of Vietnamese History, full of relics and treasures, and all housed in an architecturally impressive building. Ho Chi Minh’s Mausoleum, and his stilt house, are also fascinating places to visit. As is the Vietnamese Women’s Museum and Heritage House, one of the Old Quarter’s best restored properties. When it comes to the temples it’s equally hard to refine them to a shortlist, but the Confucian Temple of Literature, founded in 1070 and site of the country’s first university, is fantastic. The names of exceptional students have been recorded here, and it’s exciting to imagine what an honour it would be. Hanoi’s oldest temple is the Old Quarter’s tiny Bach Ma Temple, it was said to have been originally built in the 11th century by the Emperor who built this city, in monument to the white horse who is said to have guided him to this spot. Beautiful Hoan Kiem Lake is a wonderful place for a stroll, and the nearby Hai Ba Trung Temple is also worth a look in. Both the lake and the temple have some fantastic stories associated with them. Ho Chi Minh City’s Reunification Palace is an unmissable time warp, especially if you’re interested in the Vietnam War. Formerly the Presidential Palace of South Vietnam, these five storeys have been left largely untouched since the day before Saigon fell to the North. A replica of the tank that crashed through the gate ending the war on the 30th of April 1975 sits on the lawn and the whole building is filled with fantastic vintage 60s equipment. The War Remnants Museum is another must-see if you’re interested in the Vietnam War. It was opened less than five months after the war ended when everything collected was fairly ‘new’. There’s plenty of US military hardware and some fairly disturbing displays retelling individual stories, lists of missing journalists and a simulated ‘tiger cage’ prison. The other war-related must-see in Ho Chi Minh City are the Cu Chi Tunnels, an enlarged and upgraded version of resistance tunnels and a great place to learn about the experience of war from the point of view of the resistance fighters. You can also fire real weapons here. For a better overview of Vietnamese history you’ll need the Museum of Vietnamese History, also in Ho Chi Minh City, which is packed with antiquities. It’s right by the Botanical Gardens. Before the French era, Saigon was Vietnamese and there are still plenty of structures from this period, including the Giac Lam Pagoda which is supposedly the oldest temple in town. The Jade Emperor Pagoda is one of the most impressive - spectacular even - it was built in 1909 and the woodcarvings and atmospheric statues look so vibrant and lively. The Phuoc An Hoi Quan Pagoda is also relatively new and very impressive. Ho Chi Minh City has multiple marketplaces, but Chợ Bình Tây Market and Bến Thành Market deserve special mentions. Obviously the food is one of the reasons to visit Ho Chi Minh City and this is where to see it and taste it. Fancy a wardrobe update? Hoi An’s tailors will happily sew you up a new suit or gown from inside one of the photogenic Chinese-style shop houses. We suggest you bring an old favourite to have copied. This is something you can do in many of Vietnam’s towns and cities, but Hoi An is a particularly atmospheric choice. Just outside Hue, the Thien Mu Pagoda is an icon of Vietnam. Built on a hilltop overlooking the Perfume River, each of its seven storeys is dedicated to a manushi-buddha - a Buddha that appeared in human form. It’s tough to avoid the tour groups here, so arrive early. Use our guide to the best places to stay in Vietnam and start to plan your trip. 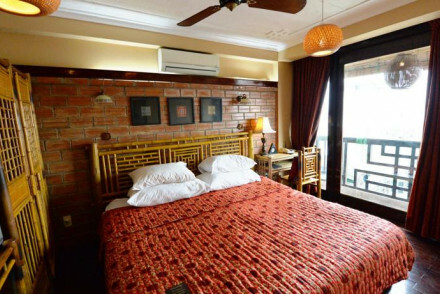 The Golden Silk Boutique Hotel is an elegant, 55 room hotel in Hanoi’s Old Quarter. The decor is traditional, but chic, with beautiful Rosewood floors, enormous beds and Vietnamese art. The bathrooms, however, are extremely modern. The Hotel Metropole is probably the French Colonial grand dame of Hanoi, a 360+ room luxurious hotel with a huge range of dining and drinking options and an extensive spa menu. The Hilton Hanoi Opera is perfectly located in the heart of Hanoi’s beautiful French quarter in Hoan Kiem. The hotel has 260+ rooms, which are simple, modern and charming, plus a choice of restaurants onsite and an outdoor pool. If you like your decor modern, the Hotel de L'Opera might be for you. It’s a luxury property in Hanoi's Old Quarter with hip design and a classic Vietnamese restaurant. The furniture is a shade of dark pink and there are large, sometimes dramatic, paintings in the 107 rooms. It’s a big name and a big hotel, but the Sheraton Saigon is smart, chic and in a great location close to the river. There are almost 500 rooms, with all the mod. cons., plus eight options when it comes to drinking and dining. The views from the rooftop bar are incredible. The Hotel des Arts is hip new and swanky with 168 white on white rooms, claw-footed bathtubs and hardwood flooring. The rooftop bar is unmissable. The Intercontinental Asiana Saigon is a slick, five star hotel in the centre of town close to the Notre Dame Cathedral and the Bến Thành Market. There are more then 300 rooms and decadent suites with hardwood floors and rather chic-chi decor. Plus you'll find a rooftop pool, luxurious spa and gourmet restaurant. 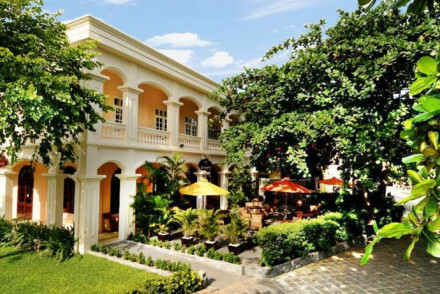 An Lam Saigon River is a beautiful boutique hotel by lush gardens right on the Saigon river. There are just 15 carefully designed villas with contemporary furnishings and Vietnamese touches. Chic and peaceful with a delicious French Vietnamese fusion menu. 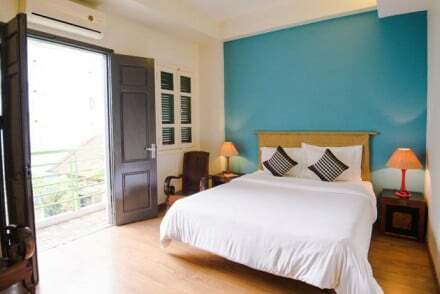 The Villa Song is a charming boutique hotel on the Saigon River to north of Bến Thành. The neighbourhood is trendy with numerous cafes, galleries and riverside restaurants. It is situated close to the Reunification Palace. Positioned on the banks of the Thu Bon River, the Anantara Hoi An is a charming boutique retreat. 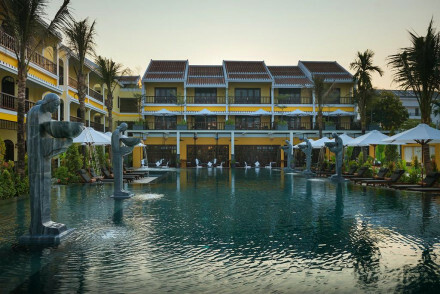 The hotel was designed to reflect Hoi An’s fascinating cultural diversity with French, Dutch, Chinese, and Japanese-influenced interiors. The river cruise is a particular highlight. Hue’s Pilgrimage Village, though not centrally located, is set in a stunning countryside village surrounded by manicured gardens and lush greenery and offers a shuttle service to and from town. Six Senses Ninh Van Bay is exceptional in all areas and its spa cannot be bettered. Come here for some serious pampering in a stunning location. 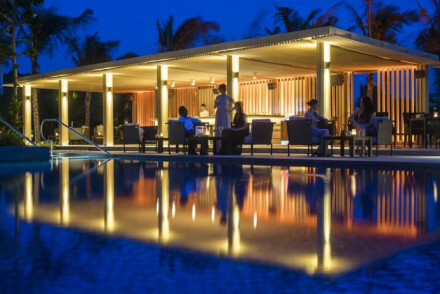 Evason Ana Mandara might only be ten minutes from the centre of Nha Trang but it feels a million miles away. And with its Six Senses spa offering speciality Vietnamese treatments. Nha Trang is also where you’l find Amiana on the Bay. Here you’ll find effortless style and plenty of romantic touches, including suites with outdoor bathtubs and couples only dining. Plus there's various pools, private beach and water sports galore. 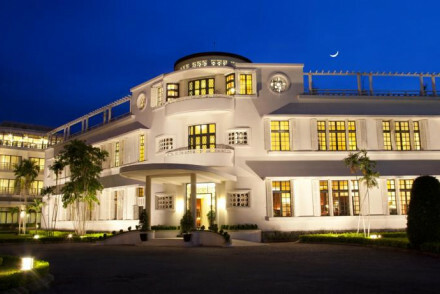 Further south in Bình Thuận Province is the Princess D’an Nam Resort and Spa, a modernist looking resort, but with plenty of colonial charm. There are rooms, suites and private villas, some with their own outdoor hot tubs. You also have a stretch of private beach and a spa. Just across from the Hanoi Opera House, the legendary Sofitel Legend Metropole is an historic hotel oozing colonial charm. The 360+ rooms have hardwood floors and French windows and the restaurant and bar are quite glamorous. Ho Chi Minh’s Hotel Majestic Saigon is an Art Deco masterpiece dating from 1925. The location is superb, as is the decor, and there’s a choice of rooftop bars and an excellent Vietnamese restaurant. The Six Senses Hideaway on Con Son Island in the Con Dao group, is a super luxurious escape on the edge of a National Park. There are just 44 eco villas, each of them elegantly decorated and facing onto a private pool area. The Emerelda Resort is a gorgeously traditional looking resort with 21st century facilities and a commitment to sustainability and the environment. 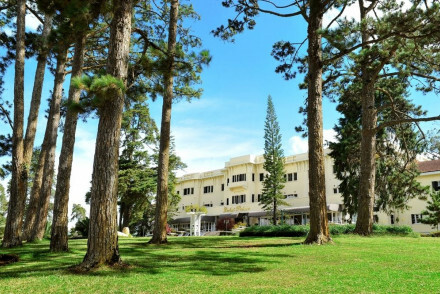 There are 172 rooms, all of them spacious, with glorious views of the mountains, and there are magnificent landscaped gardens and a choice of restaurants, serving both western and Asian cuisine. La Veranda Resort on Dong Dong Beach in the very south of Vietnam, is a rather beautiful, 19th century French colonial mansion turned smart boutique hotel. There are 70 rooms, including some lovely family suites, plus lush, tropical gardens. Evason Ana Mandara is just minutes rom the centre of Nha Trang, though it feel much more isolated right up against the beach. There are 74 rooms and suites and villas, many with private balconies and views across the bay. 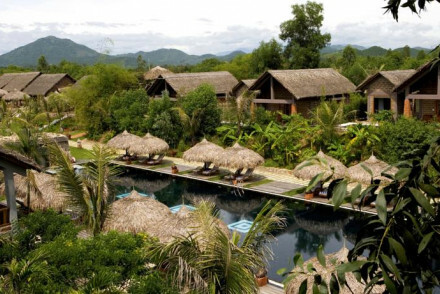 There are two pools, numerous onsite water sports facilities and a Six Senses Spa. Sometimes the big name hotels have the best family facilities, and in the case of the Intercontinental Asiana Saigon, they’re really using their years of experience in the hotel business to make it easy for you and your family. There are 305 rooms and suites - quite decadently decorated, and a rooftop pool, luxury spa and gourmet dining options. And then of course all the stuff your kids will want too. And the location, close to Bến Thành Market, is perfect. The Maison d'Orient is a small, and perfectly formed, boutique hotel in the heart of Hanoi’s Old Quarter. The 12 rooms are chic, with hardwood floors and private balconies, and the room rate starts from around £40 per night. For an equally good room rate in Hanoi consider the nine room Hotel Garden Queen, a charming little hotel full of character and antiques, in a fantastically central Old Quarter location. 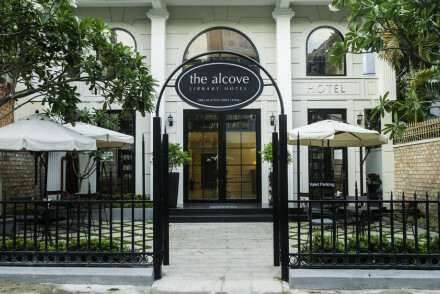 Slightly out of the way, as far as Ho Chi Minh City is concerned, the The Alcove Library Hotel is an elegant French colonial boutique hotel with decor that directs you towards their excellent and extensive library. The location is green and leafy and great for strolling. It is out of the centre of town and that’s why the room rate starts from around $56 per night. Also in Ho Chi Minh City, Ma Maison is about the same price for the same reason, it’s outside the centre of town. But aside from that it’s perfect - a quaint, 70 year old French villa lovingly converted into an eight room hotel. A calm oasis. Ho Chi Minh City Airport, is the busiest airport in Vietnam. You can fly there direct from several international cities, including London, Paris, Melbourne, Hong Kong, Beijing, Tokyo and Dubai. There are regular buses into town from the airport, plus several taxi queues. The green Man Linh and Vinasun taxis are the official ones to queue for and definitely the ones to opt for. Vietnam’s vertical length means it has several different climate zones. The north, around Hanoi, has four distinct seasons, and in the Highlands you can even see snow. In the central region there are more like two distinct seasons, the hot and dry versus cool and wet, while to the south there are three: hot and dry between March and June, rainy between July and November and cooler and dryer between December and February. The last season is the most popular time for visitors to see the south. 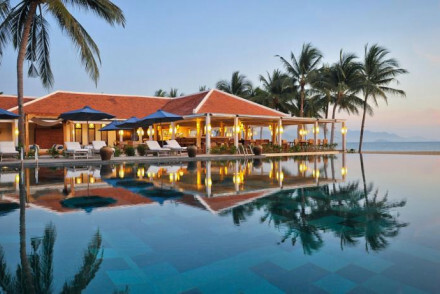 Still not sure which is the best place to stay in Vietnam for you? or the best places to stay in Hi Chi Minh City? or check out our recommendations in neighbouring Cambodia or Laos? A charming little hotel full of character and antiques. Oriental throws adorn the beds, whilst exposed brickwork give rooms a vintage feel. Unbeatable location slap bang in the busy old quarter is a bonus whilst the tranquil roof terrace allows you to get away from it all. Delicious local cuisine. Local markets - Hang Ngang-Hang Dao Market is a bustling bounty of clothes, pottery and Banh mi. Sights nearby - The peaceful pagodas of Ngoc Son Temple are a must visit. Great walks - Perambulate the scenic Hoan Kiem Lake. A small, and perfectly formed, boutique hotel in the heart of the Old Quarter. Chic rooms feature hardwood floors, clean design and large double windows leading onto private balconies. A real gem of a hotel, at an excellent price, to explore the city from. Value chic - A beautifully renovated property in the heart of the old town. Local exploring - Well positioned to access many of Hanoi's sights by foot. Sights nearby - Walking distance from St Joseph Cathedral and Hoan Kiem Lake. An elegant boutique hotel, slightly off the beaten track. The decor focusses around their extensive library, with flashes of colonial French accents. Comfortable and stylish rooms with classic and fresh look. An unusual and pleasing find. The Bookmark restaurant is popular amongst guests. Value chic - A charming and polished hotel, in a lovely green neighbourhood- and totally affordable! Great walks - Slightly off centre, this area is great for walking around and exploring without the huge bustling crowds. A quaint 70 year old French villa where charming rooms have been lovingly decorated to reflect Provencal life. 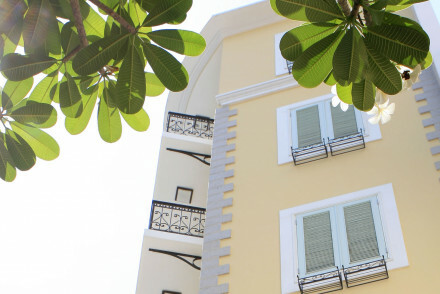 Think pastel yellow exteriors with white shutters and wrought iron balconies. Enjoy Vietnamese and European breakfast at a rustic wooden table. An oasis of calm in a bustling city. Hideaway - This quaint and charming Provencal guest house is slightly off the beaten track so you won't be swarmed with other tourists. Value chic - Picturesque, chic and run with real passion, this is a total steal for the price. Local markets - Explore the area around the hotel and get lost in the rabbit warren of banh mi stalls, tailors and food kiosks. Sights nearby - Check out the Independence Palace, just a ten minute drive away. Cooking classes - Sign up for a Vietnamese cooking class and learn to cook your favourite dish. Just minutes from Nha Trang town centre yet it feels like an isolated oasis. Romantic beachfront villas with muslin drapes, private balconies and views across the bay. Wonderful local, regional, and international cuisine. Specialty Vietnamese treatments in the Six Senses Spa. Paradise! Fishing - The on site water sports centre will organise for you to go out on a catamaran deep-sea fishing. Local markets - The daily Nha Trang market is well worth a visit and the hotel offers a cycling tour around it. Swimming Pool - Two outdoor pools. A pocket friendly and cheerful resort sitting on a lush river village, just outside of Hoi An. The lovely rooms offer tradition mixed with contemporary comforts- expect wooden floors, ceiling fans and canopied beds. With two pools, fantastic food and a world class spa. Peaceful and stylish. Delightful boutique hotel on the banks of the Thu Bon river, in a historic part of Hoi An. Light and airy rooms feature separate seating areas, private balconies and jacuzzi tubs. There is an inviting outdoor pool and spa plus fine dining at Lanterns restaurant. A stylish city setting. Great walks - The hotel organises walking tours of Cham Imperial City of My Son and the Marble Mountain. 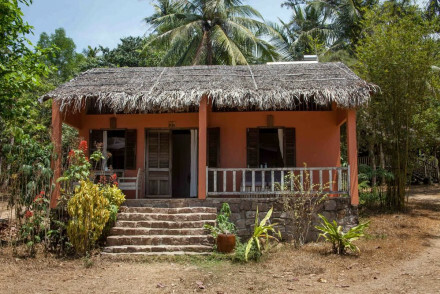 A hamlet of thatched huts spread across a wild garden, sloping down to the private beach, on Phu Quoc island. Private huts with luxurious open air bathrooms, well situated terraces and netted fourposter beds. Cuisine and views are second to none. Simple, beautiful and wonderfully unspoilt. Kayaking - The hotel provides free access to its canoes and kayaks, the perfect way to explore the bay. Great walks - Wander around the hotel's butterfly and rare orchid garden. Fishing - Hire a traditional fishing boat and head out onto the seas. Ten minutes from the airport, the Salinda Resort blends traditional Asian charm with cutting edge design, all on a beautiful tropical island. A magical retreat from everyday life, with a serious injection of style. Stylish rooms feature state of the art bathrooms and private balconies. Great walks - This beach is the longest on the island, perfect for a sunset stroll. Kayaking - Rent the hotel Kayaks and head out to explore the coast- idyllic! 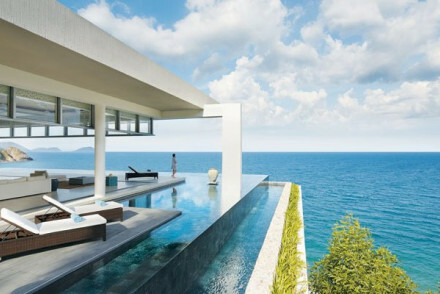 Swimming Pool - Outdoor pool overlooking the beach.